It has been proven, time and time again, that people who set goals achieve more success while those who don’t, generally achieve less success. 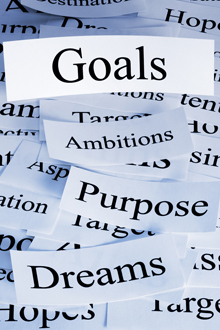 Goal setting helps us get clear about what we want, set priorities and create a plan. Consistently focusing on and working with your goals enables you to attain more results. More importantly, the process of identifying what you want in life helps you learn more about who you are. And to the degree you know yourself, you will manifest your dreams. When we set and pursue our own goals, we take control of our lives. As we plot targets and move towards them, we bring purpose and focus into our days. Our actions take on more meaning. Decisions are easier to make. Our self-esteem, happiness and fulfillment grow as we clearly see ourselves moving step by step forward in life. Just the process of writing goals down, making relative distinctions of importance between goals, creating intentions and reviewing or tacking goals are some of the key actions that make goals work. Do you have goals for your family, friends, health, spirituality, career, creativity, learning, self development, finances, home, health, sports, etc.? So you can have a balance of great goals that fit your passion and purpose, we have created for you a list of triggers for creating great goals. Start creating your ‘bucket list’. What goals fit your style and authenticity? It is never to late to create the life you were meant to lead. Download your goals trigger list and start reinventing your self today.